Can anyone tell me the purpose of the plenum on the air intake tubing, coloured grey in this photo? It's designed to mix the air and fuel so as to improve the burn/combustion within the engine. The thing is, it is nowhere near the fuel. It is before the air filter, on the primary intake tube? It is a resonator chamber, designed to optimise air pulses into engine, it also acts as a silencer, but that may not be its main purpose. A plenum is different, it is a chamber after fuel is injected to mix fuel and air. 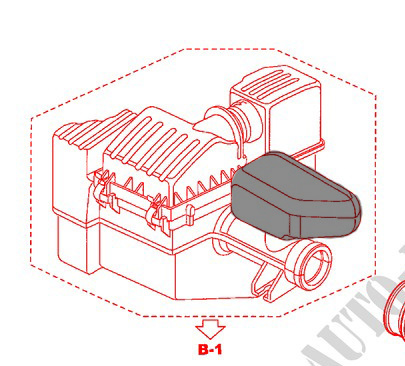 Some higher performance engines have two resonator chambers or tubes with a flap that can be opened or closed to change intake manifold resonance point and improve performance throughout the rev range. If the resonance of inlet is wrong a pressure wave may be pulling air away from cylinder just when it needs to be pushing it in. The pulses are caused by abrupt closing of intake valves stopping the moving air and the air stream bounces back down the manifold. Exhaust systems especially 2 strokes have resonant chambers to improve the scavenging - but 2 strokes are notorious for their narrow power band - but then again some have areas of exhaust that can be closed and opened by flaps, so-called 'power valves' - as a matter of interest KTM ( Austria ) have developed fuel injection for 2 strokes straight into transfer port between crankcase and cylinder - they call it TPI reduces emissions and improves fuel consumption. Also can be used to smooth airflow past MAF or MAP sensor in throttle body. I thought it must be something along those lines. I was standing about with the bonnet open and I wondered, "What the h*ll is that? ".